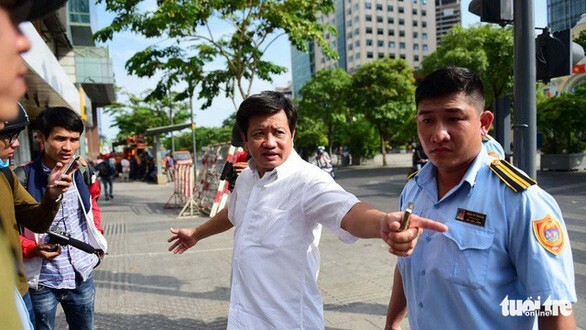 Doan Ngoc Hai, deputy chairman of District 1 in Ho Chi Minh City who is famous for his sidewalk-clearing campaign in early 2017, will continue to serve in the position as his request to retract a resignation letter he submitted in January has been accepted. Hai will continue to work as the downtown district’s deputy chairman responsible for urban affairs until further personnel changes are made, the Party Committee of Ho Chi Minh City said on Sunday. Hai, 49, is known for spearheading a drive to clear sidewalks in downtown Ho Chi Minh City of debris, illegal structures and street vendors so pedestrians can enjoy walking again. The ‘sidewalk clearing’ campaign began in early 2017 and continued well into October the same year before coming to an unexpected end. In January, Hai submitted a letter to city authorities expressing his wish to step down as deputy chairman of District 1, fulfilling a promise he made at the launch of his signature campaign that he would resign if it failed. However, Hai’s resignation never went through, and in May he requested to retract his resignation after deciding that he still wanted to devote his efforts to the development of the city. Hai said he had received tremendous support from local leaders since he asked to step down from his post in January, and the leaders convinced him to continue his role as vice-leader of District 1. Since May, Hai has resumed work and has led a number of notable campaigns to improve the city’s safety and appeal, including an initiative to remove stray dogs from the streets.